CHARLOTTE — Zion did not beat the Tar Heels Friday night. They beat themselves. The game matched its anticipated intensity, with a record crowd [clarified] for the ACC tournament in North Carolina (20,116) creating an electric atmosphere at the Spectrum Center, home of the NBA’s Hornets. Perhaps the hype over Zion Williamson’s first full (and probably last) game against the arch rival also caused nervous energy, as neither team played particularly well. Carolina was a little worse than Duke and shot a lot worse. After Cameron Johnson started the Tar Heels’ scoring with two three-pointers and eight points, the third-best long ball team in the ACC missed 23 of its next 25 from behind the arc – all the way through Johnson’s last release that he swore was going in when it left his fingertips with 18 seconds to play and the score stuck on the final 74-73, Blue Devils. There were seemingly dozens of differences between losing and Carolina beating Duke three times in the same season for the first time since 1967 (the Dukies captured what they call the triple crown in 1988, 1999 and 2002). How about the rebound two Tar Heels fumbled into the hands of Tre Jones who fed reserve guard Jordan Goldwire for an easy layup and the lead for Duke with 1:46 to play. Not dropping that carom would have kept Carolina ahead with 90 seconds left, a far more enviable position than having to hope RJ Barrett missed at least one free throw with 12 seconds remaining. Barrett missed both and Coby White could not get a decent shot off on the race downcourt; his fallaway jumper bounded off the rim, and Nassir Little failed to clean up the offensive rebound that would have won the game and made Little a big hero in Tar Heel history. Behind 33-20 with 6:24 left in the first half, Duke doubled down on its perimeter defense by putting Goldwire in the game alongside Jones to keep Coby from penetrating and/or getting the freelance offense started smoothly. From that point on, Carolina was pretty bad with the ball. After losing the entire lead, the Heels went to the locker room with a 44-44 tie. In the second half, UNC shot 33 percent, made only 1 of 13 three-point attempts and missed two critical free throws by Little and Luke Maye. The numbers were ugly. Johnson missed his last five three-pointers; Kenny Williams went 1 for 6 while White, Maye and Little combined to go 0-for-12. Carolina outshot Duke in both regular-season wins, and while Zion is a presence on defense he was far more the difference on offense with 31 points. Williamson will do that all the way to the NBA. And to beat him and Duke, teams must play better than Carolina did. At first, it looked like the Blue Devils would be run out of the building, but in the end they gave Zion enough help to stay for the ACC championship game against Florida State, a surprising winner over top-seeded and No. 1-ranked Virginia in the first semifinal. The Seminoles are big and deep and, defensively, frustrated the usually cool Cavaliers into suffering only UVA’s third – and matched its worst – loss of the season. Should FSU beat Duke and win its second ACC championship (the first came over UNC in 2012), they will endanger the Blue Devils’ No. 1 seed in the NCAA tournament. 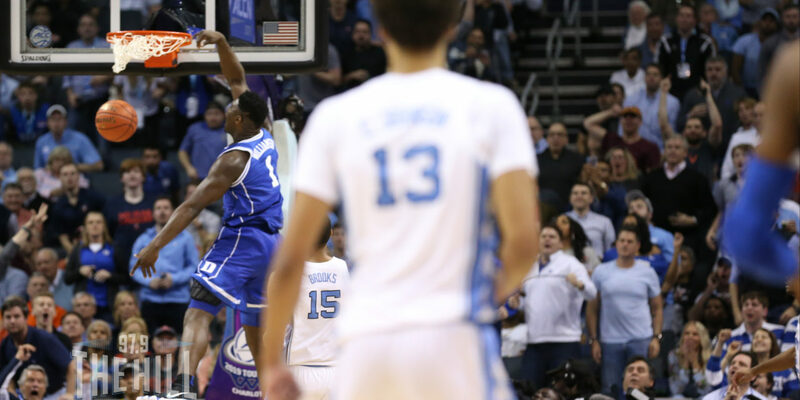 The Tar Heels, ironically, can jump back into that picture with a Duke loss. They could have taken care of business themselves, but on this night they just weren’t good enough to get the job done. Record crowd in NC for a college basketball game? I guess that should have been for an ACC Tournament game in NC? ?